Sydney - With two of the master batsmen in international cricket facing each other, there's a good chance the Cricket World Cup quarter-final between Sri Lanka and South Africa will be decided by the contribution either of Kumar Sangakkara or AB de Villiers. The South Africans are relying on inspirational skipper De Villiers to end their long winless streak in World Cup knockout matches. Sri Lankan fans, and they'll be at the Sydney Cricket Ground in their droves on Wednesday, are hoping Sangakkara can score a fifth consecutive century and prolong his limited-overs international career. "They're absolute legends of the modern game," Sri Lanka captain Angelo Mathews said. "We've seen Kumar Sangakkara hitting four centuries in a row, and I hope and pray he gets the fifth one tomorrow. "Also, AB, we all know that he's such a destructive player — when he gets going, it's really hard to stop him. So we'll look to attack him early, (and) try to get his wicket so we can push them back." The Sri Lankans have been runners-up at the last two World Cups, losing finals to Australia in 2007 and to India in 2011, when Mahela Jayawardene scored a hundred in a defeated team. Mathews said his squad was determined to go one better to send Jayawardene and Sangakkara into ODI retirement as champions. "Of course we've talked about it quite a lot," he said. "Hopefully, we can make it an historic one winning tomorrow, and go into the semis again, and hopefully go to the finals, and win there, and make it historic for two legends." Sangakkara is the only batsman to score more than two consecutive centuries at the World Cup, leading South Africa coach Russell Domingo to deduce a batting failure must be around the corner. The 37-year-old Sangakkara has played 43 World Cup games, averaging almost 46 per innings, but has played only twice in the tournament against South Africa. It started with the rain-shortened tie at Durban in 2003, which ended South Africa's run in the tournament it was hosting. He was out cheaply in the 2007 match in Guyana, where South Africa was coasting toward victory before Lasith Malinga took four wickets with four consecutive balls - a first in ODI cricket - and narrowly missed a fifth in a dramatic climax. South Africa held on to win by a wicket. While the Sri Lankan batting has been strong this tournament, the bowling attack has struggled to contain good opposition and could be missing a key player with left-arm spinner Rangana Herath in doubt due to a hand injury. South Africa has a strong pace bowling attack well supported by leg-spinner Imran Tahir, but has concerns over the lack of runs scored by opener Quinton de Kock. The last 16 ODIs between the teams have been split 50-50, and seven of the last eight have been won by the team batting first. Given that, and the fact both teams come into the quarterfinal with four wins and two losses in the pool games, it's bound to be close. And that's where De Villiers knows his leadership will be crucial. 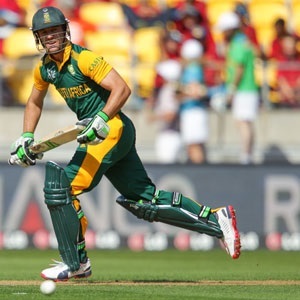 He has promised that South Africa won't let match-winning chances slip on Wednesday. "All I can say is we're not going to choke tomorrow," De Villiers said. "We're going to play a good game of cricket and come out on top. Simple." South Africa has twice posted 400-plus totals, and de Villiers hit an unbeaten 162 in a big win over West Indies, but they also lost to India and Pakistan in an inconsistent group stage. De Villiers has played 21 World Cup matches, averages 60 in the tournament, and needs only seven to pass Jacques Kallis (1 148) as South Africa's leading scorer at the event. He averages 54 in 16 ODIs against Sri Lanka, but that includes just the one World Cup match — he was dismissed without scoring in 2007. So from his point of view, the attention on De Villiers vs. Sangakkara is a very peripheral issue. "To be very honest, and I hope you don't take it the wrong way, I couldn't care less about him or me. "I just want to win the game of cricket tomorrow," he said. "If it's our No. 11 batsman tomorrow who wins the game for us, so be it. "I just want to find a way to win."